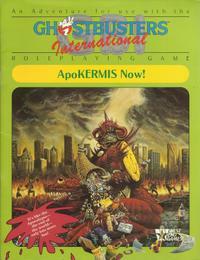 Written by the staff of Chaosium, produced by West End Games. 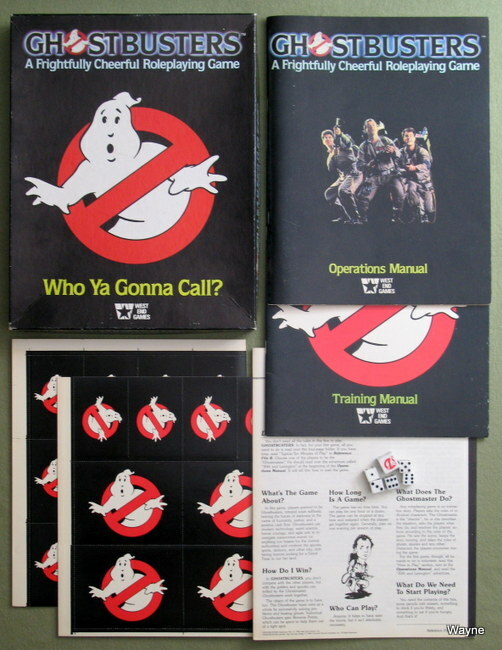 Contains: 24-page Training Manual; 64-page Operations Manual; 4 Reference Files; 6 Ghostbuster IDs; 6 blank IDs; 48 Equipment Cards; 5 dice + 1 "Ghost" die. The "Ghost" on the Ghost die occupies the "6" spot. "A Fab 48-page Flying Saucer Extravaganza! Little Lori Blander has a problem. She levitates. Her parents have a slightly different problem. They are orbiting her. When the Ghostbusters pull the Blanders down off the ceiling, they discover a tablet that predates human intelligence by at least a week. Maybe two. Next our heroes defend a junk-food factory, fending off flying saucers intent on stealing creme filling. After an exciting encounter with Swneeze-Yip, the world's nerdiest alien, the Ghostbusters learn that their tablet is actually an ancient alien signalling device... Somebody phones home. Juvenile delinquents from Outer Space! 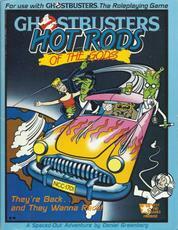 Green, four-armed, lobster-eyed aliens in leather jackets, bobby socks, and saddle shoes invade the Earth! Can anyone stop these bug-eyed punks from corrupting our youth, skateboarding on national monuments, and turning the entire planet into one big demolition derby rink? Who ya gonna call? Hot Rods of the Gods is a 48-page mondo blowout GHOSTBUSTERS adventure. Chock full of fun illustrations and pullouts, Hot Rods features an 11" by 17" card-stock map of Manhattan, The Mostly All New & Improved Super-Mega Ectomobile, and full-color hot rod counters for running the climactic demolition derby! A gas for 2-6 players, ages 12 and up." 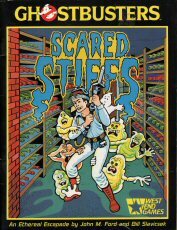 "Scared Stiffs is a 32-page GHOSTBUSTERS adventure set in the convention capital of the world - Wrath, Vermont. It's packed with illustrations and pullouts featuring the QuasCon Convention Guide, Non-Player Ghosts, and excerpts from the Spates Catalog of Nameless Horrors and the Big Book of Occult Lore. For 2-6 players, ages 12 and up." 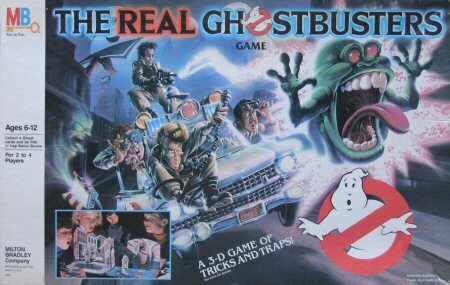 The GBI set has the same dice, including the Ghost Die, as the original Ghostbuster game set. The 5 smaller, regular dice, I have seen them in white or red. The Ghost Die is larger, always white, with the ghost occupying the "6" spot. "The indispensable defense science of the next decade - professional paranormal investigations and eliminations - is yours to pursue in your own home or office! Play the stars from the hit movies - smooth Peter Venkman, brainy Egon Spengler. sincere Ray Slantz. Or invest in the franchising opportunity of a lifetime! Create your own local Ghostbusters International office, and play your own dashing Ghostbusters! You wield the proton packs! You vanquish the slimers! You wade through federal regulations! You can save the world - again and again and again! * The Universal How Much game system for simply, accurately, and enjoyably figuring out who manages to do how much of what to whom. * The Big List of Equipment every tool of paranormal investigations from Giga-meters to Beach Kits, and every weapon from Battle-Axes to Umbrellas. * Chapters and chapters on Ghostology, Magic and Weird Science, plus Designing a Ghostbuster, Combat and Movement, and common Routines. Every page chock-full of tips and tricks to bring your roleplaying experience to life! * Two ready-to-play mini-adventures and bunches of capsule adventures. * Photocopiable release forms and EPA permits and hand-outs. * Extra characters to populate your Ghostbusters' hometown. * A solitaire adventure to introduce you to the world of paranormal investigations!" "Long before the rise and fall of the Third Reich, long before the House of Usher, long before even the rise and fall of the Roman Empire, history and literature both ignored the firse and fall of ancient Lonibabia, the nation that partied itself into oblivion. But a deadly prophecy remains, and fulfillment seems horribly near at hand. Is this the fall of Civilization? Or can the Ghostbusters gate-crash the world's last bash? 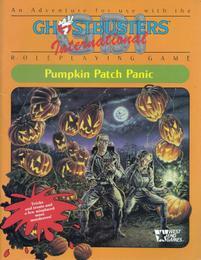 A Ghostbusters RPG adventure module." But how can the original Ghostbusters Ray Stantz, Egon Spengler, Winston Zeddemore and Peter Venkman save the world when they're locked up in the pyschiatric ward at Parkview? Who are they going to call? None other than your out-of-town Ghostbusters International franchise! 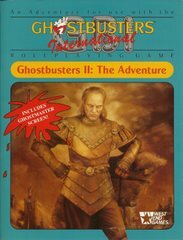 You may be out of practice, you may be ill-equipped, but the Ghostbusters know you're brimming with the spirit, enthusiasm, and sheer stupidity needed to face down the most sinister specter of all time — Vigo the Carpathian, dread sorrow of Moldavia and would-be conqueror of Manhattan Island and the world! * Actual facsimile newspaper clippings detailing the fall and rise of the Ghostbusters' New York office"
"They walk where others dare not tread, through the dark and foreboding streets of the unknown. They are the reporters tor Lurid Tales of DOOM!, uncovering the truth about the abnormal and the supernatural so that supermarket shoppers everywhere can rest easy and stay informed. 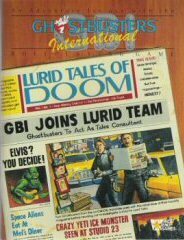 Now the Ghostbusters have joined the magazine's staff as consulting investigators, and suddenly readership is up, profits are rising, and Something Evil is trying to destroy the world! Can the Ghostbusters survive the screaming headlines, the horrific hyperbole, and the journalistic jaunts through a world where all the news they print gives fits? * A complete adventure full of news stories that no reputable news service would report! 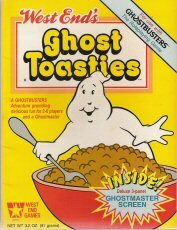 * More hilarity, spoofiness, and insanely great gaming for Ghostbusters International aficionados and closet-check-out-counter readers everywhere! * Real pages from the Lurid Tales of DOOM! magazine that serve as props, handouts, and fish wrappers." "Halloween Night—when ghosts and spirits walk the earth in search of a Really Good Time. It's usually a busy night for the Ghostbusters as they get to deal with all kinds of paranormal perturbances. But this year... things are going to be different. Now an ancient horror is rising from an unsuspecting pumpkin patch with one goal in mind—perpetual Halloween, the holiday that lasts forever! You know who to call! * loads of tricks to treat your Ghostbusters. * detailed maps of a ghoulish graveyard and Butcher Mansion. * fold-up fear gourds to frighten and delight. * pages copied from great supernatural reference works — suitable for research. * Louis Tally's recommendations for a safe, profitable Halloween season." 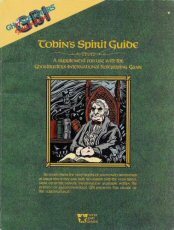 "Tobin's Spirit Guide includes an introduction by Dr. Raymond Stantz, famed Ghostbuster and paranormologist. Original woodcut illustrations from the 1920's edition! An index of Spooks, Spirits and Specters. 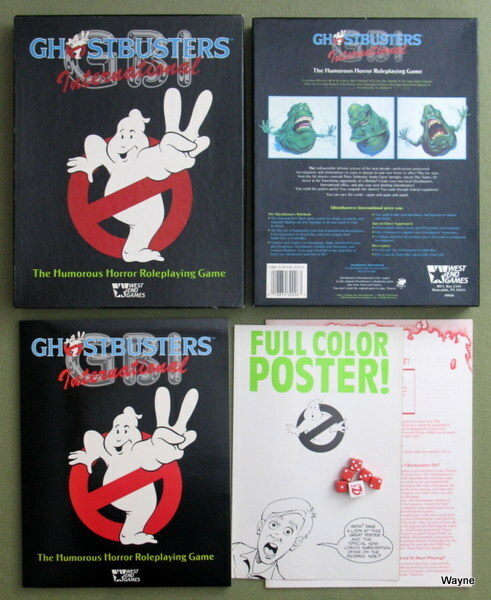 And a complete and up-to-date compilation of statistics on every shade and haunting for use with the Ghostbusters International roleplaying game." "Join those wild and wacky Ghostbusters for ahaunted hunt on a scary 3-D gameboard! They're chasing Baron Bones, the Museum's resident ghost... and the old ra-skull's got them going in circles! The chase takes place on a winding 4-part path. Collect ghost cards as you move your Ghostbusters playing piece toward the ghost trap at the top of the Museum stairway. But watch out for booo-by traps! Baron Bones could suddenly knock you off the trail, or "zap" you and free one of your ghosts! If you're first to collect 4 ghost cards, climb the Museum stairway and close the ghost trap, you'll stop the Baron from scarin'...and win the game!"